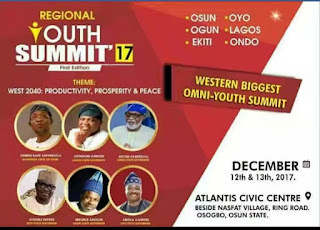 The two -day Summit was aimed at engaging the youths as stakeholders in Development Agenda for Western Nigeria (DAWN) to contribute through a robust discussion ideas which could foster amicable relationship among the people of the west and bring human and capital development. Hon Bola Ilori, Commissioner for Regional Intergration, today during his conversation with the journalist said the postponement was to allow Yorubas in diaspora to participate in the summit. He said the summit themed, ” West 2040: Productivity, Prosperity and Peace” would be attended by youths in Nigeria from the south west and in diaspora and necessitated the change.